Bethesda's VP of Marketing responds to Hearthfire's absence on the PlayStation 3. Sometimes Twitter can be a very mixed blessing, as Bethesda Marketing VP Pete Hines can testify. His personal Twitter account lit up with complaints from PS3 users after Bethesda announced the Hearthfire DLC pack was available on Steam. The PS3, on the other hand, hasn't seen Dawnguard DLC yet, much less even a whisper of Hearthfire. When one angry fan asked why Bethesda blamed the PS3 for DLC issues, Hines responded that Bethesda had never blamed anyone for anything. "It's our problem, and it's on us to solve it," Hines said. Hines was juggling a lot of queries at the time, and said he responded only because so many people were pinging him all the time about PS3 DLC. Hines said he had no new news, and asked for patience when fans continued to inquire about DLC. Hines didn't want to get into an in-depth Twitter debate but he did say, in response to a question as to what the PS3 problems were, that the performance wasn't good enough. "For most folks, it'd be fine," Hines said. "For some folks, it wouldn't be." This isn't the first time Hines has had to go to bat for Skyrim DLC on Twitter. In the past, Bethesda representatives have said that the problem is one they may not be able to solve. 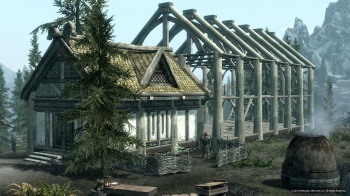 When Skyrim first launched on the PS3 it suffered significant lag issues, and at the time it was thought that the PS3's restrictive memory architecture, coupled with the game's RAM-gobbling saves, could be to blame. Bethesda's playing its cards close to the chest, but a similar issue may plague the DLC.